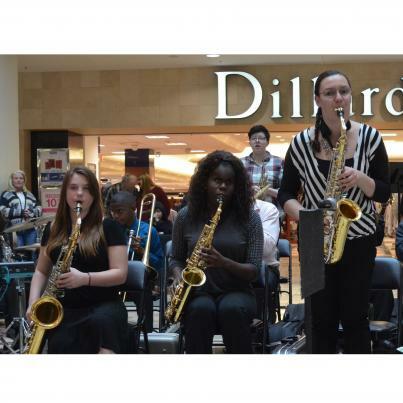 Oklahoma School for the Blind Jazz Band students perform during National White Cane Safety Awareness Day at Woodland Hills Mall in 2017: (front row) Shannon Winters, Taiyauri Thomas and Richelle Zampella; and (back row) William Winston and Jillian Matthews. TULSA, OKLA. – The Oklahoma School for the Blind will celebrate National White Cane Safety Awareness Day on Monday, October 15, at Woodland Hills Mall in Tulsa. Woodland Hills Mall is located at 7021 S. Memorial Road. OSB faculty will display educational exhibits beginning at 3 p.m. The award-winning OSB Jazz Band, which earned 2-A state championships in 2016, 2017 and 2018, will perform at 6 p.m.
After the performance, students will share information about OSB and White Cane Safety Awareness Day. Students and faculty will demonstrate proper cane techniques and build awareness as they walk in the mall beginning at 6:30 p.m. Everyone will be invited to join the walk to show support. National White Cane Safety Awareness Day recognize the connection between effective cane use and travel safety and independence. OSB is currently educating 93 residential and commuter students who attend classes Monday through Thursday on school campus, which is headquartered in Muskogee. As the statewide resource for students who are blind or visually impaired, OSB also serves students with visual disabilities who attend other schools, their families and educators throughout Oklahoma. For more information about the Oklahoma School for the Blind or National White Cane Safety Awareness Day, contact Karen Reed at (918) 781-8228 or kreed@osb.k12.ok.us. The first white cane laws were drafted around the time that National White Cane Safety Day was established by presidential proclamation in 1964. Today, similar laws exist in all 50 states and in the District of Columbia. Oklahoma law requires drivers to completely stop their vehicles 15 feet away from pedestrians who are visually impaired and identified by their use of white canes or dog guides. People who violate this law are guilty of a misdemeanor punishable by imprisonment for up to three months or $100 fine or both.